Thank you for your interest and support in keeping Wellspring’s GP services in this purpose-built property. Below are the issues your GPs here have been battling with over the last six years. The £15million building was opened in April 2012 and the practice has occupied part of this as a purpose-built surgery to date. Wellspring now serves 10,000 patients. The freeholders are Nottingham City Council and no tenancy agreement has been signed (cannot be agreed) between the council and our landlord, NHS Property Services. Originally, the building housed three GP surgeries, but two of these vacated some time ago. Wellspring has worked hard to accommodate the influx of patients this created. There have been numerous service charge issues over the years. Our service charges have increased tenfold since 2012 with no clear explanation nor reasonable justification of this and this is what we are disputing. If new charges are to stand it will make the practice financially unviable and could potentially bankrupt the partners. Wellspring has had a GP resign due to this situation and it is possible there may be further resignations. The current financial position/risk has made it impossible for us to recruit a replacement partner and, as a consequence, we have had to stop accepting new patients. The partners are unable to stabilise the practice until there is a solution to this issue and are very concerned for the practice and, of course, our patients. This situation has now reached the point where Joanne Sherwood, Practice Manager, and the GP partners have written to senior MPs (Health Secretary Jeremy Hunt and Jonathan Ashworth, shadow Health Secretary) and our local MP, Chris Leslie, about the situation. The GP arm of the British Medical Association, the General Practitioners’ Council, are currently looking at this together with the ongoing support of the Nottinghamshire Local Medical Committee to help us reach a solution that means people in St Anns continue to have locally-accessible GP services in the building that was purposely built for them. As detailed in the poster in the waiting areas, you can directly contact Chris Leslie, MP, and the Nottingham City CCG to make your voice heard and also sign the petition at reception. Your support means a great deal to the practice and we will continue to keep you updated. 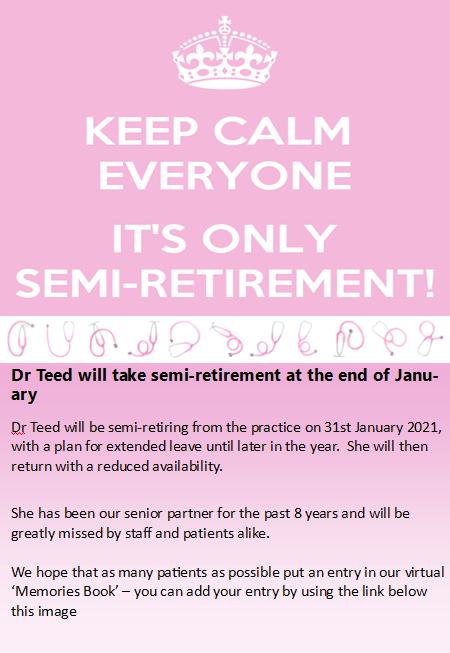 As from the 19th December we are temporarily closing our practice list until 19th June 2019 when we will review our position. For those patients that sit outside this criteria please got to NHS Choices: www.nhs.uk where you will be able to find other practices in our locality. Please accept our apologies for any inconvenience caused and be assured we have not taken this decision lightly. The closure will allow us to review our current staffing resource against patient demand, so we may continue to provide continuity of care to our patients in the future.